After just dipping our toe the rental world (good god) its naive to pretend the neighborhoods of Williamsburg and Greenpoint, where I’ve lived over a decade, haven’t changed. It’s also, I have to remember, grumpy to resent it. After all, I was part of the beginning of these changes and I sure didn’t like being resented for it, but all that knowledge doesn’t make a mammoth, hologram-bedazzled, meat packing restaurant with a kama sutra bathroom (that surely made the copywriters of Thrillest faint with the innuendo opportunities), any less unnerving… After all, the conversion of this part of Brooklyn to an extension of pricey Manhattan has actually driven us out of the city (we move West in three weeks). 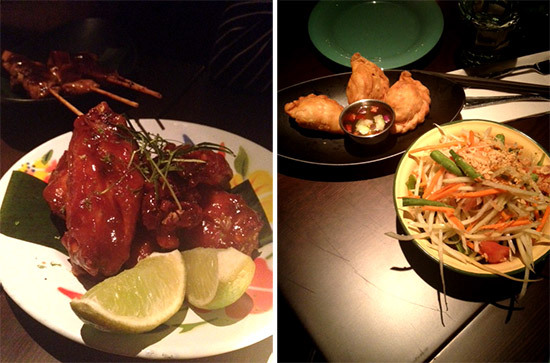 Fortunately for you all we leave behind, Qi Thai Grill also has good food. It reminds me a lot of the late Planet Thai: A place for new Brooklynites to take their parents (who are helping with the astronomical rents) to show off what a cool place they are moving to. Yet, it’s also a place that locals can get a decent meal (good Thai in the area is a rarity) including some cheap lunch deals. One big positive about the menu, which is already drawing crowds because of the chefs who hail from Pong and (the ever awesome and considerably less glamorous) Sripraphai, is that it’s not afraid to go spicy and as much as possible features traditional, even challenging ingredients: beef tendon, pork trotters and jaws sit next to Pad Thai (for the less adventurous). Even with that dish, though, you’re encouraged to try the traditional way – with dried shrimp (which does sound great). I opted for a very filling Chicken Chiang Mai Noodle that had a flavorful curry broth and was perfect for the chilly weather. Of all our appetizers, the spicy wings were the biggest hit but the papaya salad and curry puffs are also worth a taste. 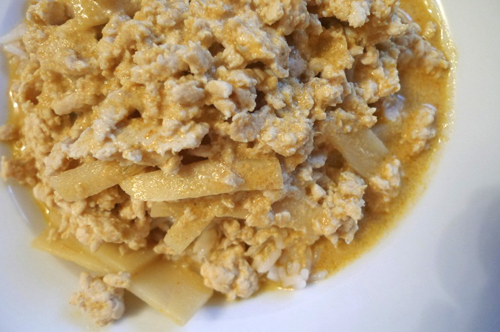 This Thai recipe for Curry with Bamboo Shoots called for ground beef, but I went a lighter route with ground chicken instead. As monochromatic as it looks, it was alive with flavor and quick to make. 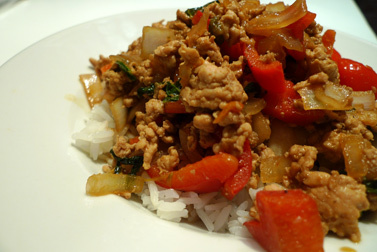 This excellent and affordable recipe for Gai Pad Krapow, also known as Thai Basil Chicken is totally superb! The rice, the fish sauce, the basil and the fried egg combines to create a very complex but well balanced dish. No one would believe how easily it all comes together. This is one I’ll bookmark to make over and over in the future. Any restaurant rumored to rival Woodside darling Sripraphai is enticing to me and Chao Thai in Elmhurst (just a block from the excellent Indonesian hole in the wall Minangasli) is often mentioned in the same discussions, often called Queens best Thai food. It’s a tiny spot, we lucked out with timing to grab a table, several people after us waiting outside for the eight or so tables to finish up. The staff is friendly and local groups of teens seem to love the place. We started our meal on a very high note. An order of crispy scallion pancake/dumplings (there is surely an actual name for these but I can’t find it) was absolutely incredible. I’ve had the crisp outside – chewy inside appetizer before but never so delicious. It comes with a sticky sweet soy sauce and should be a must on your visit. 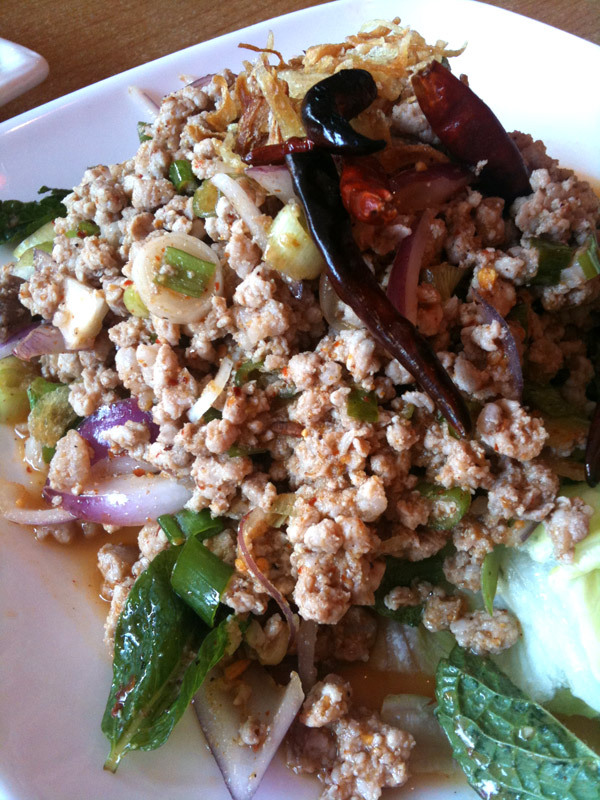 For my main dish I ordered one of my favorite foods, Larb. 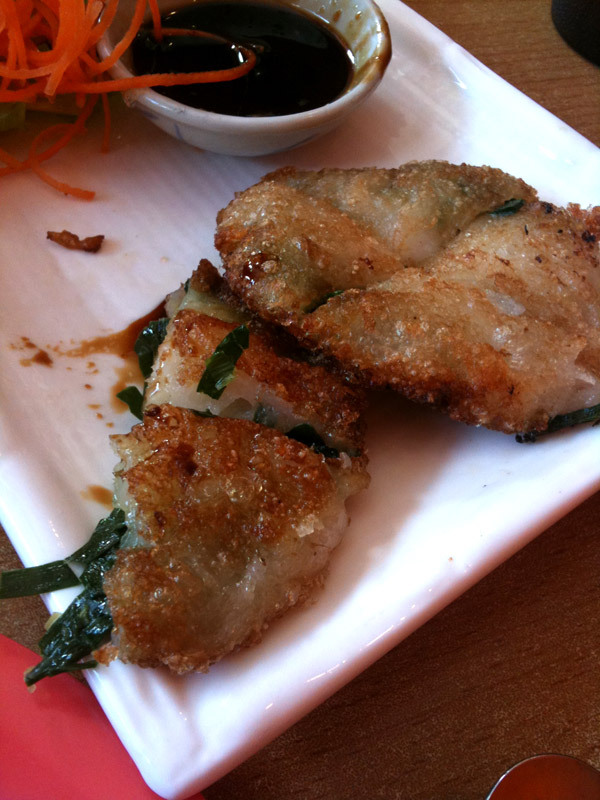 It’s listed as an appetizer but with a lovely hunk of sticky rice, it’s more than enough for a main dish. Nicely balanced between flavors it was a great rendition of the dish. Jim opted for one of his staple orders, Massaman Curry with Beef and was equally pleased. Chao is BYOB and Sietsema is a fan. I love the Chelsea Market, but spend much less time there than I’d like. While a Ronnybrook chocolate chip shake and a lobster roll are my go-to indulgences when I do make it to the west side foodie heaven, during a recent trip with my family, (and an unbelievably long lobster place line) we opted for the overlooked Chelsea Thai, the best Thai in the city according to a very picky friend. 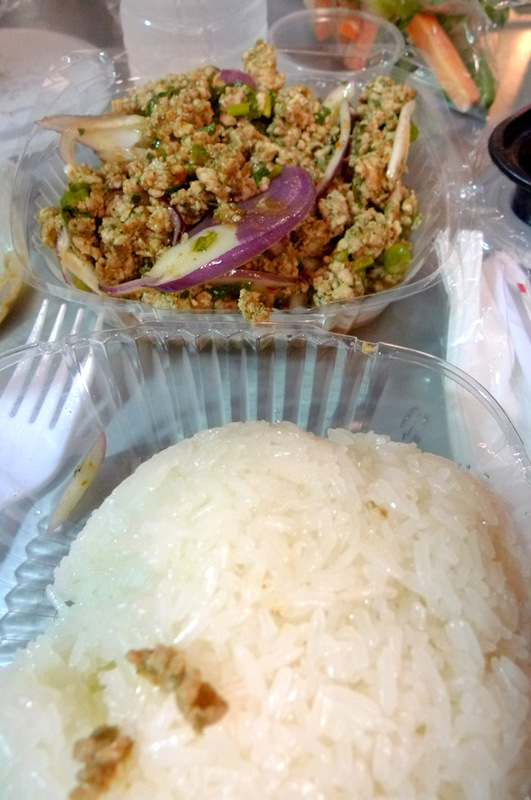 Their Larb Gai, one of my favorite dishes anywhere, was certainly note worthy – tempter rising spicy and loaded with complex incredible flavor. Most of the noodle dishes are also great, though after ordering via number system, I can’t recall the particular names of the ones we sampled. I do know that one was uncharacteristically bland in comparison (it had a soy sauce and lettuce). Rarely too packed, I highly recommend you give this place a try next time you’re in the mood for something substantial and with kick. And a Ronnybrook is perfect for cleansing the spice afterwards. Spicy ground meat Asian dishes are officially my new specialty and this superb Pad Krapow recipe, which I found at Simple Foodie (who also gave us some incredible fried cow) is going to be added to my roster. 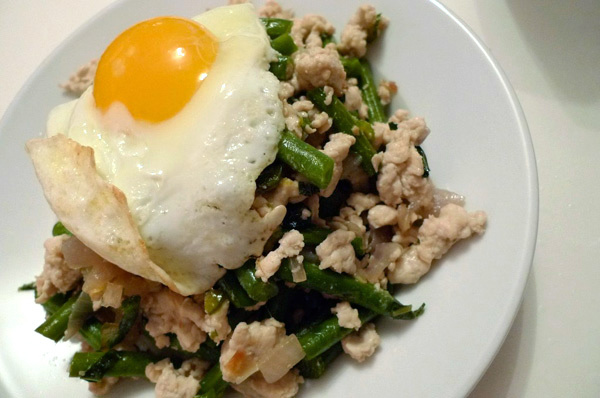 FYI: Pad Krapow is a Thai recipe that many restaurants refer to as Basil Chicken. How empowering, to be able to make one of my favorite restaurant dishes at home and have it actually taste delicious! 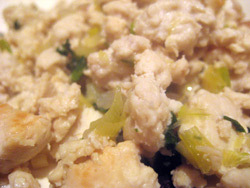 Larb Gai is a ground chicken salad with a uniquely limey, slightly spicy and sweet taste that I was first introduced to at Sawaddee in Providence while in college. It was love at first bite. I was too lazy to toast my rice this time, but the crunch is probably worth the minimal effort. Pair with white rice and a crisp beer ideally.